How about an amazing magical Branson experience? Hamners’ Unbelievable Variety Show is the realization of a dream that Dave and Denise Hamner had to produce and present an entertaining family friendly magical variety show that would appeal to all ages. And do it they have! This show is a virtual cornucopia of magical entertainment that transcends mere illusions. 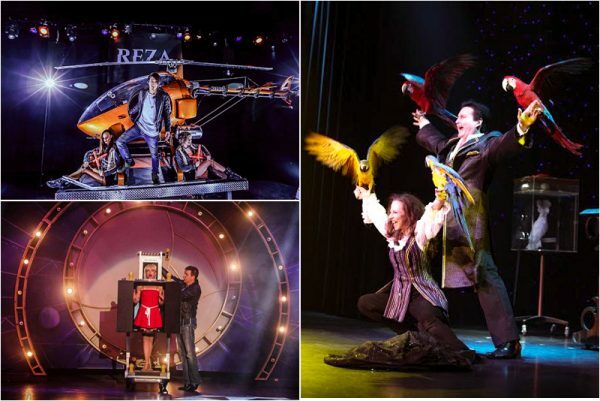 Along with the Hamners’ award winning magic, including their signature illusion, featuring beautiful Macaws and Cockatoos, this unbelievable show features some of the best dance, music, comedy, and acrobatic performers in Branson as “Birds Appear, People Fly, and Voices Soar.” It’s two hours of magical entertainment that the whole family will love. For more information, tickets or reservations on these or other great Branson shows, attractions or lodging please contact the Branson Tourism Center, one of Branson’s largest and most respected vacation planning services and sellers of over 5 million Branson show and attraction tickets by calling 1-800-785-1550 or through their website www.BransonTourismCenter.com. Pictures used in composite courtesey of respective shows. This entry was posted in Branson Shows, Featured on September 27, 2018 by Gary Groman.